The site has new arrivals and special sales pretty much every week. One of this week's special events is A Touch Of Handmade, where a bunch of ShopLately's best handmade merchants are offering their wares at a discount! 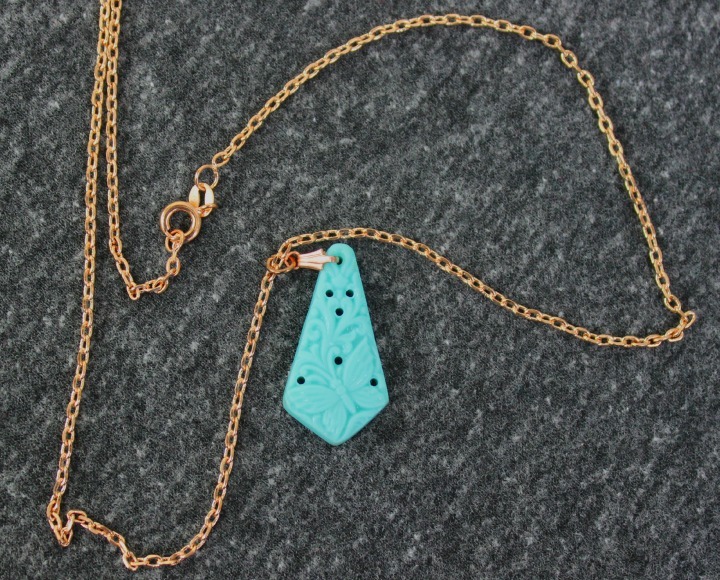 As I mentioned above, one of this week's sales is focused on merchants who create beautiful handmade goodies. 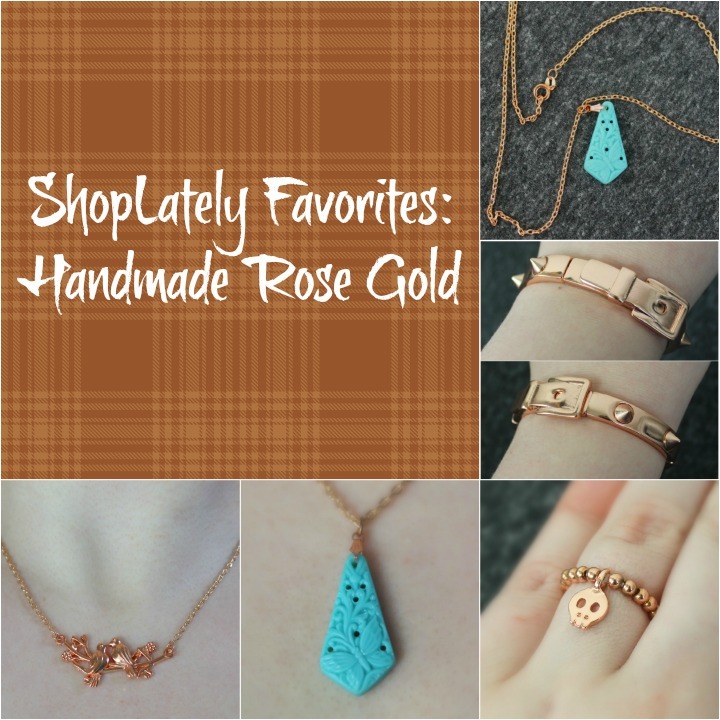 I was giving the site a good browse a couple of weeks ago, and couldn't help but notice the abundance of amazing rose gold jewelry made by seller Rivkasmom, so I picked out a few of my favorites from that shop to share with you—hope you like them as much as I do! 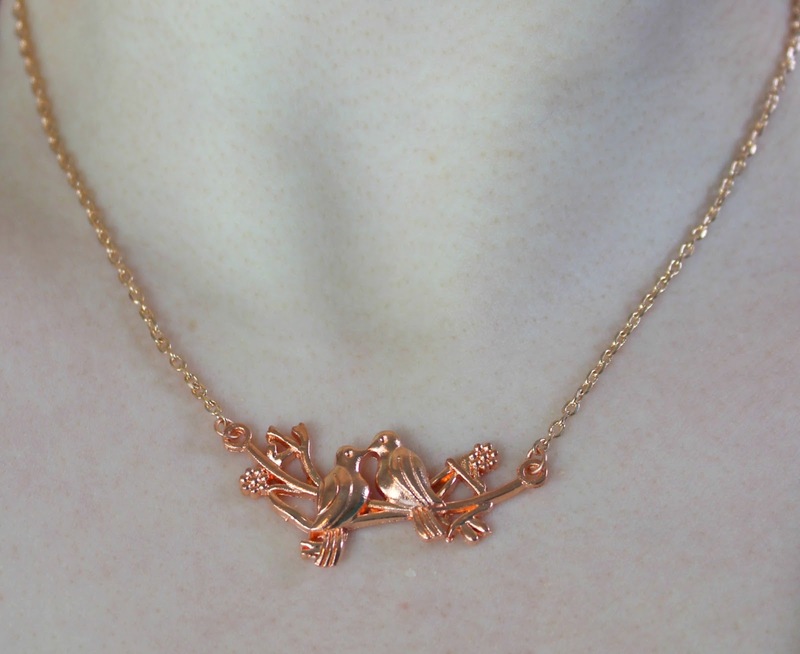 Two adorable lovebirds perched on a branch, hung delicately from an 18" chain. 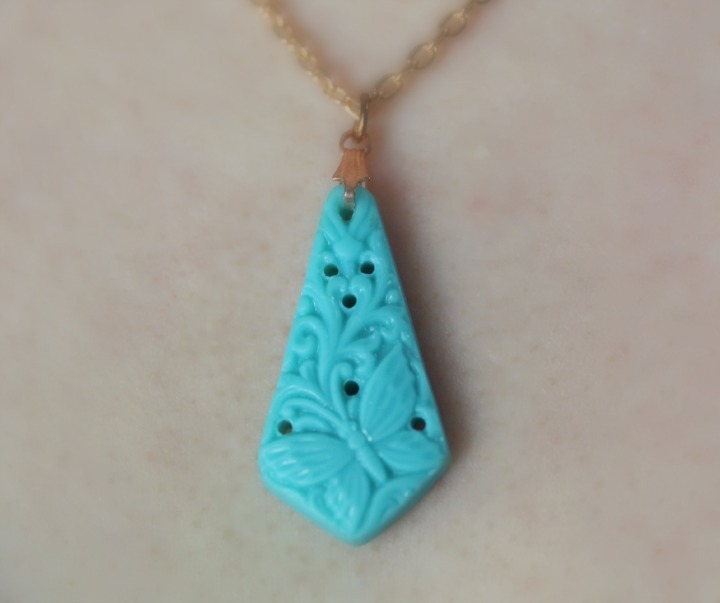 I was really impressed by the level of detail on this necklace, and couldn't resist because it's just so darn cute. Not sure if I have anyone who is shopping for a female significant other reading, but if so I think this would make a lovely gift for your sweetheart. It feels sort of vintage to me. Maybe because I had a stationery set with a similar motif when I was a kid, heh. And now for something a bit different! I tend to think "delicate" when I think of rose gold for whatever reason, but this bracelet is thick and maybe even sort of edgy? It's constructed of several metal plates with spikes (and even a faux buckle) molded into it, but is quite easy to take on and off because the plates are held together with elasticized bands. Handy! Since this has a fair bit of stretch, I think it's definitely a "one size fits most" sort of deal. Speaking of elastics, this ring is also stretchy! The sizing guide on the product page says that this will probably fit ring sizes between 6 and 8. 5. All I can say is that I wear a 7 on my ring finger and this fits me great. Rivkasmom actually included this as a little bonus item with my order, and I was really grateful because there was a bunch of adorable skull-themed jewelry in her shop that I was considering pretty hard. I'm looking at you, Tricolor Skullies necklace and Mini-Migrane earrings. Perhaps next time! Of course Rivkasmom isn't the only seller on ShopLately to offer gorgeous rose gold pieces—check out this gorgeous ring by Anci Decor Jewelry! Anci Decor has a variety of engraved metal jewelry including rings, necklaces, bracelets, etc. 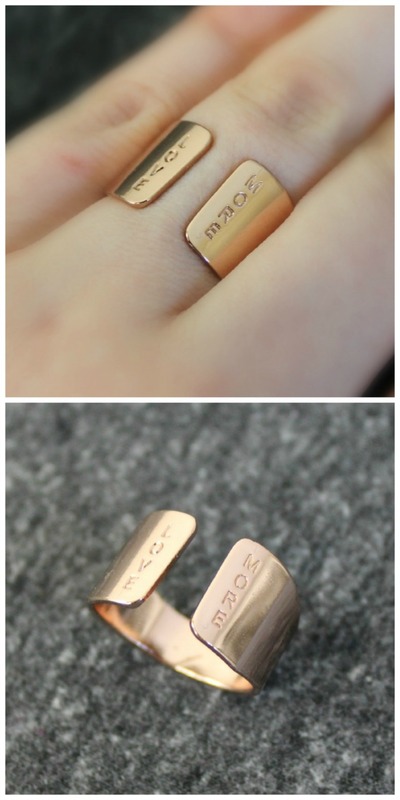 I chose this "Love More" ring because... well... we could all love more! This particular ring is about 1/2" inch wide and quite comfy to wear. It's available in three sizes—I picked up a medium because their size guide said it would fit sizes 7-8, and I can confirm that it fits my size 7 finger quite well. Like what you see? Head on over to the "A Touch of Handmade" sale page for more (ends on 11/24 at 8AM PT). This event isn't just limited to rose gold, by the way—tons of different handmade baubles are included. I don't know about you, but I've always appreciated the uniqueness of handmade jewelry as a gift, and since the holidays are coming up ... well, you know what to do. If you are planning some ShopLately purchases, don't forget to sign up for your new customer $10 credit and check out the Insider Program trial for free shipping! Which of my jewelry picks do you like the best? Do you prefer rose gold or other metals? I love that spiked bracelet! The little faux buckle is so good. 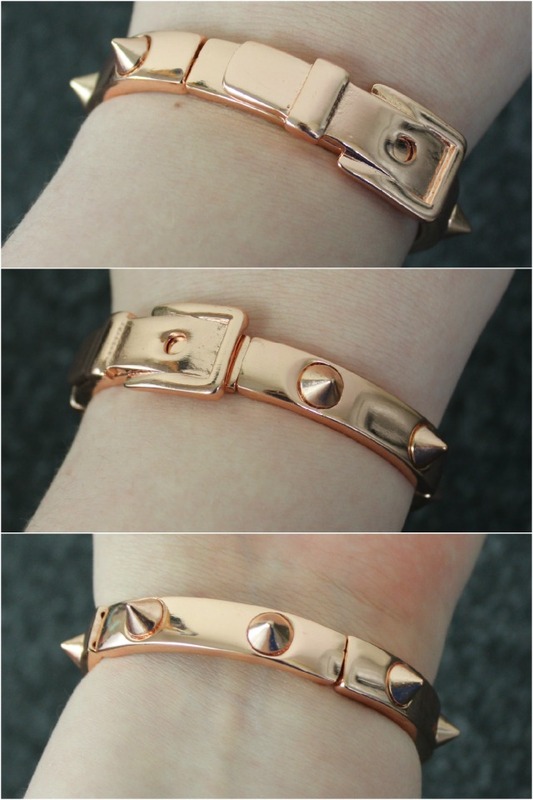 I like the Spike Buckle bracelet! I tend to like a mix of rose gold with other metals. For example, rose gold and silver look really nice together. Yeah it really is! I was impressed with how great it looked in person. That stretchy skull ring is adorable! Omg, I'm obsessed with this site! I really love Rose Gold and I think the skull ring looks so cool! Haha, there's lots to obsess over! I love all the rose gold skulls in this particular shop, lol. I really like rose gold, but I don't have a lot of rose gold pieces. The skull ring is so cute! Me neither. I always like the way it looks, but I have more silver ... I've been trying to branch out!